but for every massive coiner there is a 1000 players who are behind. If they pile more upgrades on everybody now, even more will walk away. What's the point having 500 huge coiners and nobody else left playing ? I was just trying to verify the XP numbers I have on the wiki for the higher levels. So again, it would be extremely helpful if you can post your exact numbers. I would ask someone else but I don't see a lot at your level. Now I am curious as to how much a level 49 has and needs. Perhaps I will understand why I have played so long and not leveled up compared to the newer players. Thanks for showing an interest Troy. I can only assume it is due to coining upgrades. I was just trying to total how much I spent in this game to date. Looks like just over $1200 in the past 6+ years I have been playing. I was like wow...most were $10.00 gold purchases and some $50 depending on when a sale was on. I was thinking more like $600.00 but looking back on my settings and the purchases for war commander I was way off. Looks like my first purchase was made in July of 2013. Oh boy! So I am normal for my expected level judging from my XP? 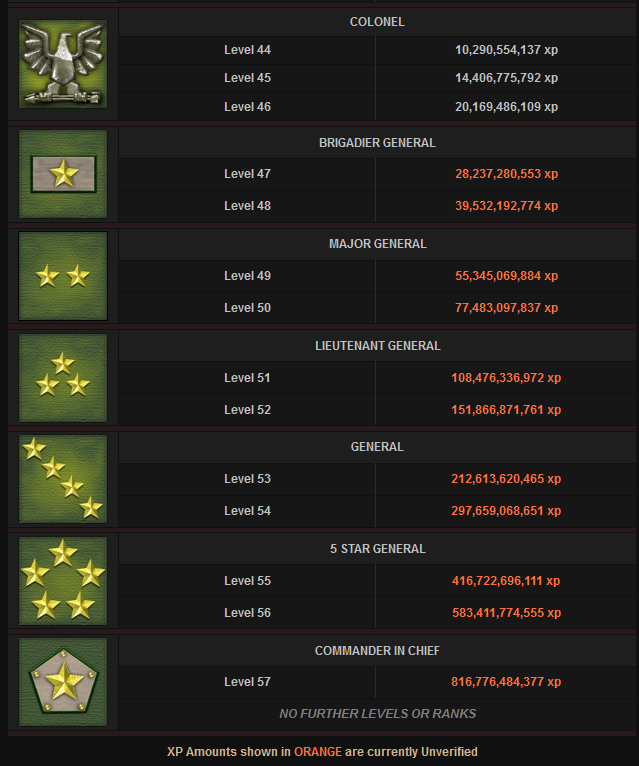 I have 7 digit id and playing daily for over 6 years (Dec. 2011) almost done with base upgrades (except for platforms which take forever lol). How did so many players with half my time invested get so far ahead of me? I spend most of my time hitting resource bases, tokens, op, and everything else the comes out to do. I mean the level 49 talking here said hes been playing a year less then me and he is 4 levels higher then I am. I can't believe he has done that much more of anything then me to get what at this rate will take me another 4 years to reach. I spend way to much time on this game and still seem to stand still. But I will go by what I am informed of in this post. Nothing else I can do. I thought there was a problem with my game. I'm stuck at lvl44. Been there over 2 years and showing no signs of being any closer to 45 in 2018 than I was in 2016 lool. Maybe it is because I am so much more aggressive then you and I help so many more players...(Just kidding of course). Could you put a picture of your level experience in here like I did and maybe Troy can see that too. I would like to compare my #s to yours anyway. I was waiting for that level 49 to post his pic too. Guess he don't want to for some reason. I have 13 billion with 1.4 billion to lvl45. My issue is nothing seems to pay any xp. Thankfully I don't care but its funny as my entire clan has overtaken me now lol. So I have over 16 Billion and need an additional 3+ billion to reach level 46. Total 20 billion reaches level 46 according to my pic of my level XP I put in here. (Correct me if I am wrong, I never was very good at math)...So then you Crofty need at least 14 billion total to reach level 45 (as I am now)....Then you will need and additional 6 billion Just to reach level 46. We are going to be left so far behind at the rate I am seeing out there that we may have to join a kiddie clan lol. 6 years to 17 billion for me.... But the rate has slowed down now I guess due to longer upgrades and less things to upgrade. And I will most likely be offline when the upgrade completes, which from my understanding we don't receive unless we are on at the moment of completion. That is a considerable amount of XP I wont see.... That is why at least in part, coiners have an advantage. Pay for the instant upgrade and get lots of xp for it (BOOM! Level up). All my buildings and turrets are maxed as well as many other things. Hmmmm.....They say "Money isn't everything" But in this game it sure is lol. Wonder who "They" are anyway lol. Well, I confused myself enough for one day. Enjoy. Well it adds up yes but we are talking BILLIONS not millions of XP. It takes over 22 Billion XP to get from Level 49 to 50.
its the same as going from Level 1 to Level 44 more than twice..., And all without the xp from all those Building upgrades. Just to generate 1 Billion XP you would have to do around 11,000 HZ 90's. Oh,you don't even get XP for the Thorium you loot from Players or PvE bases either. I see more and more of high levels with low crap bases. I have asked how they do it. Guess it can suk to be them. High level with no skill or good stuff. Set up for lots of embarrassing moments. Never thought I would make it to level 45 (level 30 with mega tanks was my goal back in the day) but now level 45 is not even that much. But I earned one hell of a good base with all the big toys. 6 years in the making. 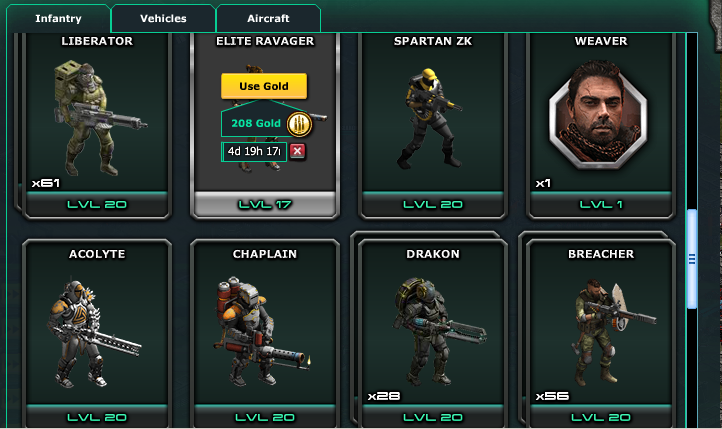 I must have missed something here, and this may be a dumb question, but how did you upgrade your ravagers to 17, I can not upgrade mine past 10, I thought you had to have omega siege to upgrade them that high, and unless I am wrong there has been no way to get the omega parts yet. Or is it a problem with my account that i can not upgrade them any higher, I have elite siege. erm have i miss something as i know u can get tango delta and alpha but where is sigma coming from ? I don't even bother to upgrade this account anymore. My main account, that I started before this one, still has over 500 days of building upgrades left & I build continuously. I refuse to coin upgrades to try to "catch back up" because it is pointless. Keep pushing me further back with new long upgrades & I might decide to stop playing altogether. The Air platoon called Sigma is the PvP airborne platoon that can only be used for PvP. Then you had to write a support ticket, if you want to talk to Kixeye directly. The forums, especially "General Discussion" would be senseless if people shouldn't comment. At the end you shouldn't think just about heavy coiners boreness because they have no patience and can't wait for time upgrades...There are people playing this game that don't want or are not able to waste their money here. If they just make more and more content or upgradelevels you'll coin it up and cry around again, because there's nothing to upgrade again and the non or low-coiner players upgrade-mountains will get higher and higher. So you may coin lesser or play something else while waiting for new content when you're bored. Thx for your 5 cents but game not meant for free riders kixeye is a business! Perry299 said:At the end of the day they wanna make money lol hence free riders don't make the game the ones that pay the salaries do! Flat out if they didn't make money there wouldn't be a game! I notice most of the posters on forums tend to be the free players and non coiners! Iám glad i did not bye token in the offer. i still need token. have 2 maxed with Token. it give me some to do, it would be easy coin, but i see now it get more boring than it is now if i did not have token to do, i have stil O War-rig lv 21. O Blackout lv 21. O phantom lv 32. O SStorm lv 35. O hydra lv 35. O juggernaut lv 36. and the last new. it take time get reso for it. and token for the last, but many cant even make Token´s. i like help some get units, and a few parts. they need do some But even get the 80 parts for 1 or 1 that got back in game, they nearly give up seeing what they mist.! i know there will be new upgrade, but for now i do not need it, just glad i did not spend on max units. than i will have nothing to do i like do little pvp. but start spend coin on that, i leave to others. Do you think about what would happen when every free player stop playing the game? Or low-coiner? You heavycoiners won't have much PvP anymore because you have no enemys anymore that you can slap. Except you enjoy killing dead bases. No free to play-game works with heavy coiners only. There have to be always victims/cannon fodder for the moneybags that they can increase their self-esteem. It probably be more peaceful lol the non coiners tend to be the whiners all the time! Isn't that the eventual fate of any game? I remember paying $45 for a Atari 2600 game cartridge ages ago... those games eventually went away but I still have great memories of playing them with my friends!